The use of your space. Carpet colors can lighten dark rooms or calm a bright space. 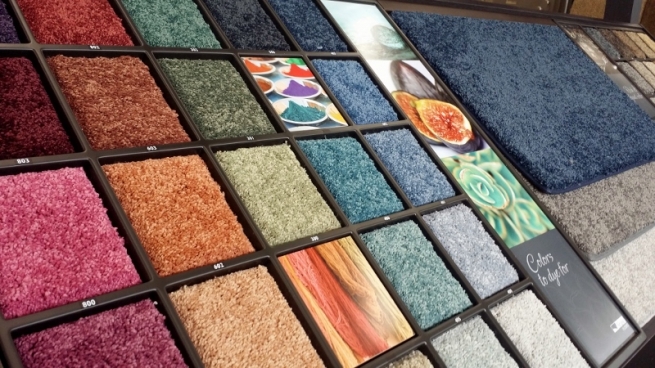 Alternative carpet colors can be the focal point of a room or keenly hide stains better than their beige counterparts. When thinking about the use of space, keep in mind that rooms with a lot of natural sunlight may fade a dark carpet. Traffic levels. Foot traffic causes wear and tear on flooring. In high-traffic areas, like hallways or family rooms, a quality darker carpet that can take a beating is recommended. Use light-colored carpets in rooms that receive little traffic, like guest rooms, sitting rooms or offices. Interior décor. A carpet can make an interior design fashion statement or blend in with the rest of the room. If you want the carpet to blend in but want to use a non-traditional color, choose a carpet that matches a prominent color in your curtains, sofa pillows or the color of your accent wall. Alternatively, use an accent color to make your carpet the focal point of the room (for example, a room with a black-and-white theme paired with a red or yellow carpet).